What exactly is a Household 6? And what about the Diva part? Part of the military subculture is often being referred to as "the Spouse". And part of having children is being referred to as "the Mom". Well I want to shake the tree a little. the one who was her own person BEFORE she was married and had two children. Yes, I am a Household 6 -- but I'm also a little bit of a Diva too!! To me, a Diva is a celebrated success in her expertise. She has grace in her performance and yet enough attitude to hold her own. She is feminine. She is humble. She is hardworking. She is a patriot. She paints her toenails pink and always carries lip gloss! So now -- Let me ask you! 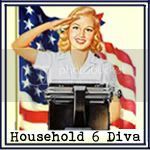 Are you a Household 6, with a little bit of Diva? Then grab yourself a free button and display it with pride!